Rooted Practice: Tasty Tuesday: Gumbo Deliciousness! Now that the weather has turned cold, I thought I'd pull out one of my favorite recipes. It requires a little bit of prep work the night before, but coming home to hot gumbo on a cold day was definitely worth it! This is the original recipe I've used for a long time--however, I lightened up the recipe a little bit by using half the amount of roux and using Trader Joe's Smoked Chicken & Turkey Sausage instead of regular Andouille. I also modified the recipe to work in the slow cooker--but you can follow the stove top instructions in the original recipe if you'd rather just cook the whole thing in your Dutch Oven. Stir the onion, bell pepper, celery, and sausage into the roux; cook 5 minutes. Stir in the garlic and cook another 5 minutes. Season with salt, pepper, and Creole seasoning; blend thoroughly. Add the chicken broth and the bay leaves. 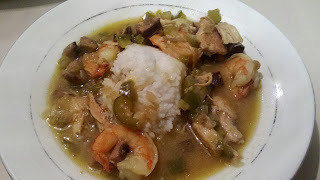 Place the chicken breasts in the crock of the slow cooker and pour the rest of the gumbo over top of it. Cook on low for 8 hours. About an hour before you serve the gumbo, remove the chicken breasts, shred them, and add them back into the gumbo along with the raw shrimp.